Registration opens December 1 for the Spring 2019 TOPSoccer season! The Spring season is held indoors. 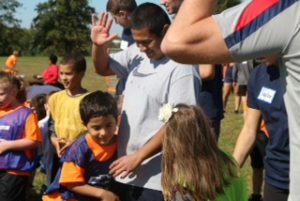 TOPSoccer (The Outreach Program for Soccer) is a community-based soccer program designed to meet the needs of athletes with physical, developmental, and/or intellectual disabilities. Player participation and development are key elements of the program. TOPSoccer is designed to improve the overall fitness, self-esteem and social skills of your athlete. In short, TOPSoccer takes individuals from the sidelines to participating in the game. Play dates: Information about play dates and times are on the online forms. Registration fee: $25, with scholarships available upon request covers player insurance, equipment (for use at pracctices), team t-shirt, soccer shorts, soccer socks, snack at the end of each practice, pictures, and a trophy/medal at the end of the season. How we play: Athletes are divided among the three teams based on both age and ability. Our youngest team (ages approximately 4-7) practices from 1:00-2:00 while our two older teams (ages approximately 7-11 and 12 and older) practice from 2:00-3:00. LYSA TOPSoccer tries to provide an individual buddy to each player when requested.